Last week I decided that I wanted to try making lasagna in a crockpot… I thought, “Hey, this sounds easy! I don’t have to cook the noodles? YAH!” Boy was I wrong. 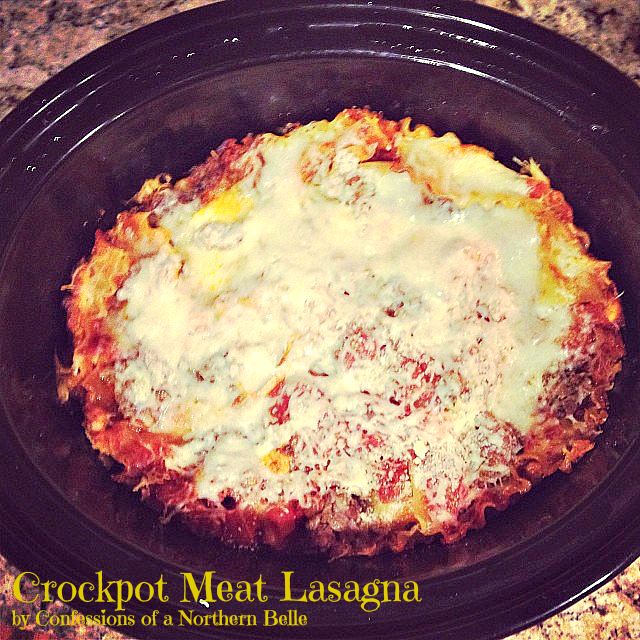 Making lasagna in the crockpot is just as time consuming as making lasagna the old fashioned boil-the-noodles way. However, I must say that lasagna in a crockpot is quite tasty and may be worth the effort once in awhile. 1. In a large skillet, saute your onions, ground beef, and dried basil over medium heat until the meat is no longer pink. Optional: drain your meat in a strainer – I like to do this to get rid of the extra fat! 2. Mix together the egg, ricotta, 1 cup of shredded mozzarella, Italian seasoning, salt and pepper in a large bowl. Put the rest of the mozzarella in the refrigerator. 3. Cover the bottom of your crockpot with a layer of thin sauce. 4. Break your lasagna noodles to fit into the bottom of the crockpot. Spoon a layer of meat onto the noodles. Spread a layer of the ricotta mixture on top of the meat. Spoon a light layer of tomato sauce on top of the meat. 5. Add another layer of broken noodles. Add your meat and ricotta (skip the sauce!). Add another layer of noodles. Then add your meat, ricotta, and sauce. TOP with noodles and a thin layer of sauce. 6. Cook on low heat for 4-6 hours until your noodles are soft. I checked mine at 5 hours by piercing the top layer with a knife – it was perfect! Top the lasagna with remaining mozzarella cheese – cover and let stand for 10 minutes or until cheese is melted. Looks so cheesy and delicious! I need to try it! Yum! This doesn’t sound too bad… tearing the cooked noodles is always the worst part for me! I wish I had been more prepared when it came to my hospital bag, but we were so far away from the hospital, and we went to the city to stay over a week before we ended up getting induced, so it was hard to know what pack. Then we got stuck in the NICU for 5 days, and pretty near starved to death. SO next time I have a baby, I’m going to be more prepared!! It was definitely easy if you hate the cooked noodles! Oh it was SO cheesy and good! Putting the cheese on last makes a huge difference. You’re very welcome! I hope that you test out the recipe! Let me know how it goes. Thanks Deanna! I have a small robe in my bag now! Oh my goodness! I keep worrying that I will end up having to go to the hospital from somewhere random and won’t have my bag on me! Mine looks a lot like yours! Don’t forget chargers for cell phones and stuff.